And I intend to speculate wildly about them. Light Spoilers for up to The Rings of Akhaten below! Right, as with any post that sounds like it was written by someone clinically insane, I'm going to start by talking about dead people. Let's get the obvious one out of the way. Victorian Clara Oswald was born on November the 23rd, 1866 - meaning she shares her Birthday with the 'birth' of Doctor Who. As all fans will probably know, the first ever episode, An Unearthly Child, was broadcast at just after 5.15 pm on November the 23rd, 1963. But her tombstone reveals another link to Classic Doctor Who - Victorian!Clara was 26 years old when she died by Ice-lady-induced free fall in The Snowmen. What's the relevance of 26 years? Why, The original run of Doctor Who lasted from November 23rd 1963 to December 6th, 1989... almost exactly 26 years. Let's stay with tombstones (I'm not done being crazy yet), but fast forward from the 19th century to the 21st, to the grave of Ellie Oswald née Ravenwood, Present!Clara's mom, as seen in The Rings of Akhaten. Both Ellie's Date of Birth and her Date of Death have Doctor Who links, but let's start with the less tenuous one, March 5th 2005. It's importance? It's the date that the events of Rose take place on (or at least partially, as Rose takes place over two days). But wait, I hear you shout! Rose was broadcast on March 26th 2005! That March 5th date can't be right, can it? As we learn in Aliens of London, Rose has been missing since March 6th, 2005 - having joined The Ninth Doctor on his travels the night before... March 5th. It's not a considerable leap to imagine that Ellie and Dave Oswald lived in London, as it's where Clara is from. Ellie was only 44, tragically struck down before her time... was she a victim of the Auton's attempted takeover? We know there were casualties (Clive being one of the first, and we see Jackie walk past several bodies during the aftermath). Maybe Ellie was caught in the crossfire. Now this where we get a bit crazy (Only now!?) - Ellie's date of birth, September 11th 1960, doesn't have an in-universe connotation like her death, but it does have an interesting, if extremely tenuous link in the real world: Pathfinders in Space. Pathfinders in Space was the first serial in a wildly popular ITV sci-fi trilogy that started airing on September 11th, 1960. What's this got to do with anything? Well, the Pathfinders serials were produced for ITV by the broadcaster ATV. Specifically, they were produced by a man who desperately wanted to make Children's science-fiction adventures that excited their audience as well as educated them: Mr. Sydney Newman. The vast popularity of Pathfinders lead to Newman being poached by the BBC as Head of Drama in early 1963... where he went on to produce a new Children's serial, intended to thrill children but also teach them about History, a little known series that you might have heard of - Doctor Who. Alongside Quatermass and Journey into Space, Pathfinders is recognised as one of the key influences on the development of Doctor Who. Now let's top off that slice of crazy with a bit of rampantly speculative mathematics! Clara mentions that she was 16 when her Mom died (remember that the ages 16 and 23 were missing from the front of her copy of 101 Places to See? Seems like Clara was a little too emotionally occupied to update those years - first her mother's death, and then Mrs. Maitland's, landing Clara in her Nanny position in The Bells of Saint John). 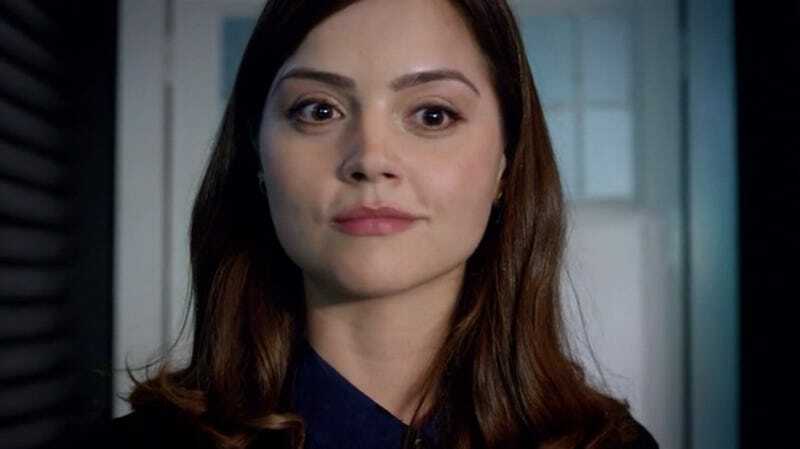 This would make Clara's year of birth 1989 - not only the year that Doctor Who ended, but also informing us that, in 2013, when she joins the Doctor, Present!Clara is 24. Present!Clara is 24. Victorian!Clara was 26. Add those two together and you get... 50. What anniversary is it this year, by the way? I love humans. Always seeing patterns in things that aren't there.